Our no-slip fabric shoe covers are made of 100% spunbond polypropylene, which provides breathability for non-hazardous and low particulate barrier applications. This low-lint, non-woven fabric helps filter particulates for contamination control in critical environments. These shoe covers with traction have a thin traction tread pattern on the bottom. Each bundle contains 100 no-slip fabric shoe covers. Fifteen (15) bundles are included in a case for a total of 1,500 shoe covers (750 pairs). These are the same as KBNS28-750 shoe covers. 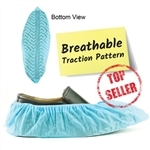 Each bundle contains 100 safety shoe covers with traction. Fifteen (15) bundles are included in a case for a total of 1,500 slip-on safety shoe covers (750 pairs). These are the same as KBNS28-750 shoe covers.